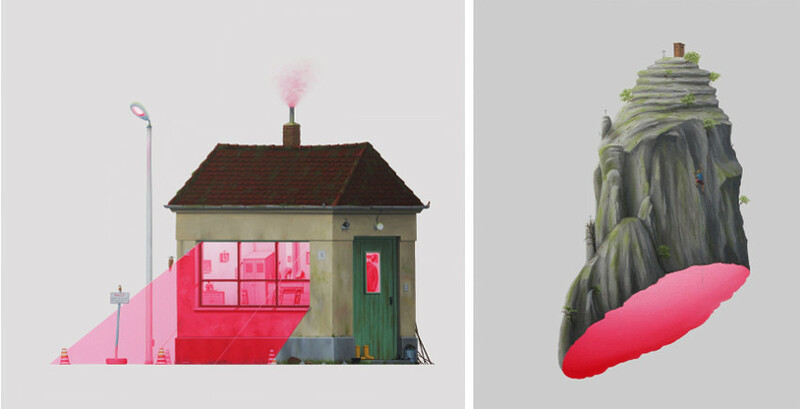 With the intention to show the beautiful and slowly disappearing ordinary and industrial East German architecture, André Schulze creates realistic oil paintings with surreal situations from architecture, landscapes, and animals, always with a touch of irony and humor. In his highly detailed paintings, this German contemporary artist focuses on creating perfectly painted details, as well as a perfect painting overall. His artistic journey began in the mid 90’s when graffiti had a boom in East Germany and everyone wanted to do it. He was just 13, spent all of his money on cans, went to the local Hall of Fame and created his first artwork. Graffiti was the main part of his life, and he would travel with his crew, painting walls all over the country. In the early 2000’s, he began making canvas paintings, which was the beginning of a transition from urban art to the fine art. 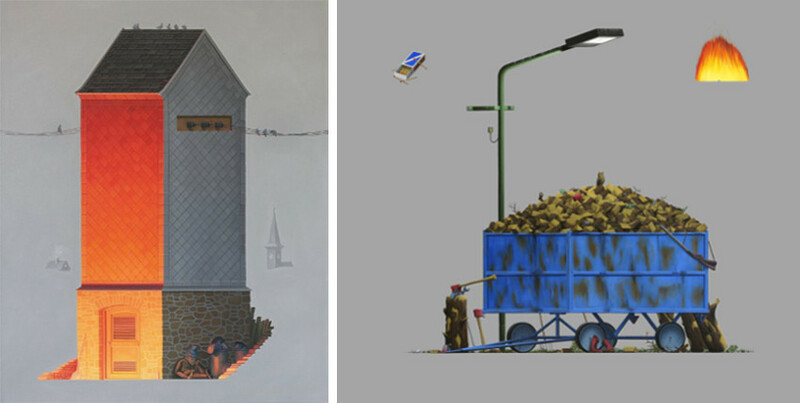 In his paintings, Schulze works with the architecture and landscape around him. As a cyclist, he travels around his hometown of Dresden, photographing architecture that slowly disappears either by breaking down or losing its origin by reconstruction. He wants to give these buildings a special attention through his works because they usually have a long and interesting story to tell. In the past few years, the artist’s focus has been on creating a “perfect” picture. A lot of time is spent on each painting – it can last up to two months, with most of the time going to the processes of thinking and working on the details. They are very important since they can tell their own story and give the painting various different meanings. “When you look closer at my paintings, you will not find any brushstrokes or mistakes. That kind of perfectionism makes me sometimes insane. But I want to make it as good as I can, however long it takes.” In his studio, he has a quite big collection of photographs he personally captured, looking for old buildings from the German Democratic Republic, abandoned houses, and industrial plants. The ones where he can tell a story through his painting are the most interesting ones. “Mostly I pick out the most interesting house from the latest photographs and starting to sketch it on the canvas and thinking about what I want to tell with it. In the main painting process, sometimes the story takes new ways and details talk their own speech.” All in all, he wants to create paintings where the viewers will find more and more stories the more they look at them. Schulze was influenced by graffiti from an early age, but his attention shifted to graphic design and contemporary art. When he was about 22 years old, he made a decision of turning his passion into a job. In 2004, he began a graphic designer studies, and around this time, he also became more opened for new inputs, opening his eyes for graphic design, photography, and art. “But then I realized that art is that thing for me I wanted to do. I finished my education and begin to study fine art at my local university Hochschule für Bildende Künste Dresden in 2006. In this time and before, I was watching my hometown and country changing. Buildings, factories and art from the time of the GDR were demolished and disappeared from the country I was growing up.” He began traveling around East Germany in quest of preserving some of its unique architecture. “Influenced by artists from the Neue Leipziger Schule, like Neo Rauch, Martin Kobe or Tilo Baumgärtel I started to bring my photographs into paintings. At the first time in a very expressive way, but later the influences by the old masters like Caspar-David Friedrich, Jacob van Ruisdael or Hieronymus Bosch took place in my art. In 2011 I finished my study and started to work as a freelance artist.” Undoubtedly, Schulze’s greatest inspiration is his childhood in GDR and the early 90’s. He saw the country breaking down in 1990 and all the changes that were happening in the landscape and the city he was living in, Dresden. In his works, the artist always reviews his own childhood and the time in which his parents and grandparents were growing up. Schulze’s art style evolved over the years. During his studies at the Hochschule für Bildende Künste in Dresden, he was painting with big brushstrokes in an expressive way. Over time, his brushes got smaller and smaller, and now he’s working with 0,5mm. Between 2011 and 2013, the landscape was an important part of the paintings. In 2014, he started replacing landscapes with colored backgrounds, like sundowns and sky views. At this time, he also changed the angles of his houses, now painting them in and low angle nearly isometric. His goal is to concentrate on the essential. Then, in 2014, his began a new series by reducing the background to a monochrome gray or white room, while his houses became a zero degree angle without perspective lines with all of the lines going horizontal and vertical. This was a rather radical step, but a one that gave the artist new power and fresh ideas for upcoming works. Through them, the artist wants to achieve different things. He wants to work with the architecture around him and show the secret places and buildings typical for his region. When he’s working, Schulze wants to tell a story with his paintings that are sometimes melancholic, sometimes ironic, and always full of funny and interesting details seen only after a closer inspection. 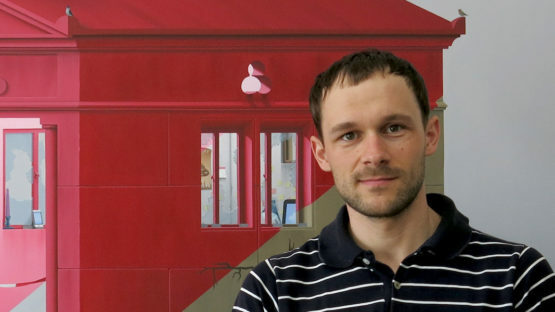 André Schulze lives and works in Dresden.